Born in Cornwall, Angus J Allen – better known in his day as ‘Bones’ – started his lacrosse career around 1898 with the Cornwall Colts of the National Lacrosse Union. He then played one season in the Canadian Lacrosse Association with the St. Catharines Athletics in 1903 before joining the Ottawa Capitals in 1904. Allen then remained in Ottawa for the duration of his Eastern lacrosse career as he also held down employment at the Department of the Interior. He played the attacking midfield position with occasional assignment as the inside or outside home on the crease. His size and shifty play made him exciting to watch in action. Well-regarded by his fellow players, Allen “…was a prince and a fellow. Bones played hard. He could take the bumps and hand them out with never a whimper. A real man and a real sport,” is how opponent Gordon ‘Grumpy’ Spring recalled him, when interviewed by the Vancouver Sun the day after ‘Bones’ passed away in 1941. 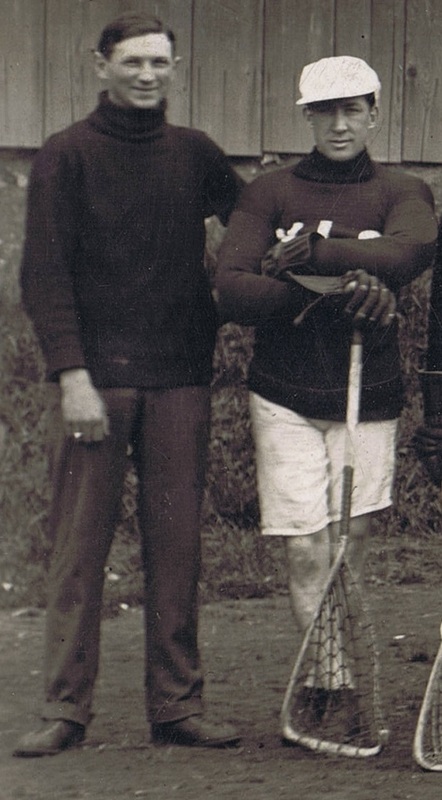 ‘Bones’ Allen with Vancouver trainer Pete Muldoon in 1912. In 1907, the Ottawa Capitals traveled to Great Britain and played 16 games against teams located all over England. With a record of 15 wins and 1 draw, ‘Bones’ Allen led the team in scoring as the Capitals out-scored the English 168 goals to 43. Gaining attention as a solid lacrosse star, he was almost lured south of the border to play lacrosse in St. Paul, Minnesota later that same year. He came west with the Ottawa Capitals in 1908 in their challenge for the Minto Cup. While he was staying in New Westminster with the team, he met his future wife there. He would return back east with the team, but then made his move westward as he entered into the bonds of matrimony. The following year, in the spring of 1909, saw Angus Allen sign with the talent-stacked Regina Capitals for two games – playing alongside such greats as Édouard ‘Newsy’ Lalonde, ‘Bun’ Clark, Johnny Howard, and Harry ‘Sport’ Murton. The prairie team had doled out the cash to load up on ringer talent in their attempt to take the Minto Cup off New Westminster Salmonbellies, losing the two games series 6-4 and 12-2. Allen then stayed on the Coast and three weeks later was suiting up for Vancouver in their season opener. ‘Bones’ Allen would play six seasons for the Vancouver Lacrosse Club as one of Con Jones’s many hired hands from Ontario. Despite being at the peak of his game when he arrived in Vancouver, there were some doubts about him from some of the local pundits. After a season in Vancouver, he silenced them with his play and became as well-respected as if he were one of the local lads. 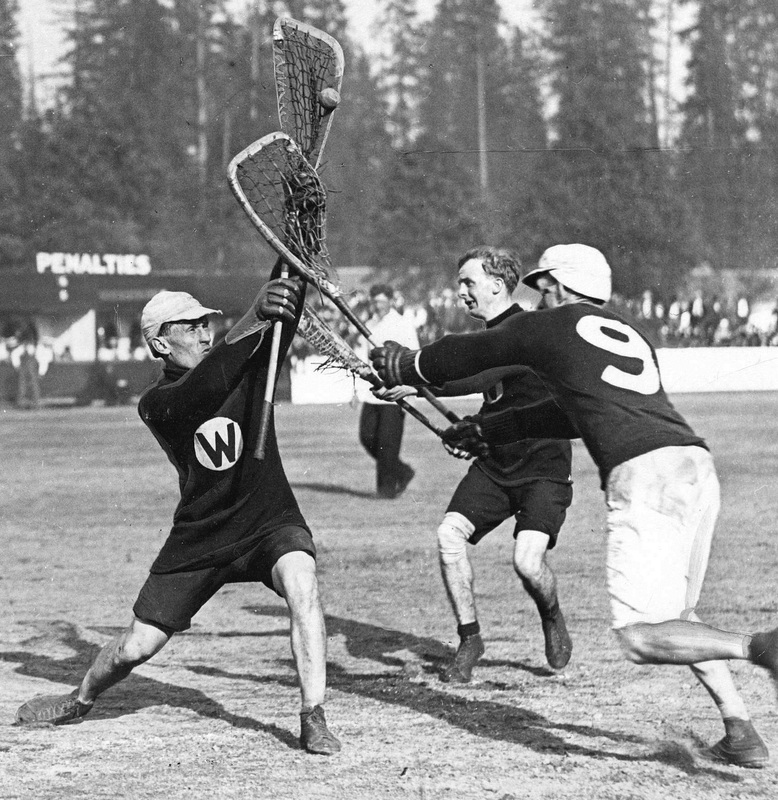 He would finish second in goal scoring for the Vancouver Lacrosse Club in 1909. His best season on the Pacific Coast came the following year when he scored 10 goals in 11 games to lead all Vancouver players. He retired after the collapse of the 1913 season and then went overseas – but when Con Jones got back into the game, ‘Bones’ was lured back for one final campaign in 1915 before hanging up his gutted stick for good. 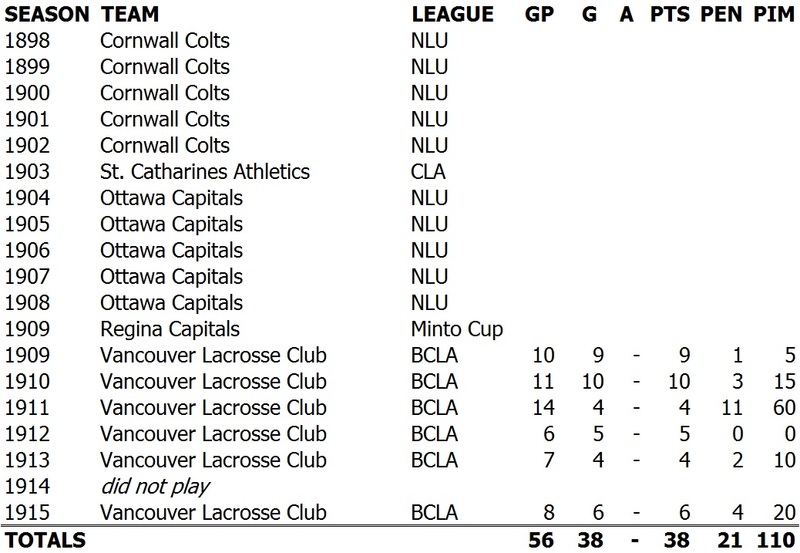 He played in a total of 56 games for Vancouver Lacrosse Club, scoring 38 goals and penalised 21 times for 110 minutes. He is ranked 14th in career scoring amongst all professional players on the Pacific Coast, and tied for 12th , with ‘Haddie’ Stoddart, in goal scoring. ‘Bones’ Allen is one of only three players ever to win both the Stanley Cup and Minto Cup as Canada’s national champion in professional hockey and professional lacrosse. His ice hockey career spanned from 1901 to 1909, winning the Stanley Cup in 1904-05 with the famous Ottawa Silver Seven. His two Minto Cup championships followed in 1906 with Ottawa Capitals and then in 1911 with the Vancouver Lacrosse Club. 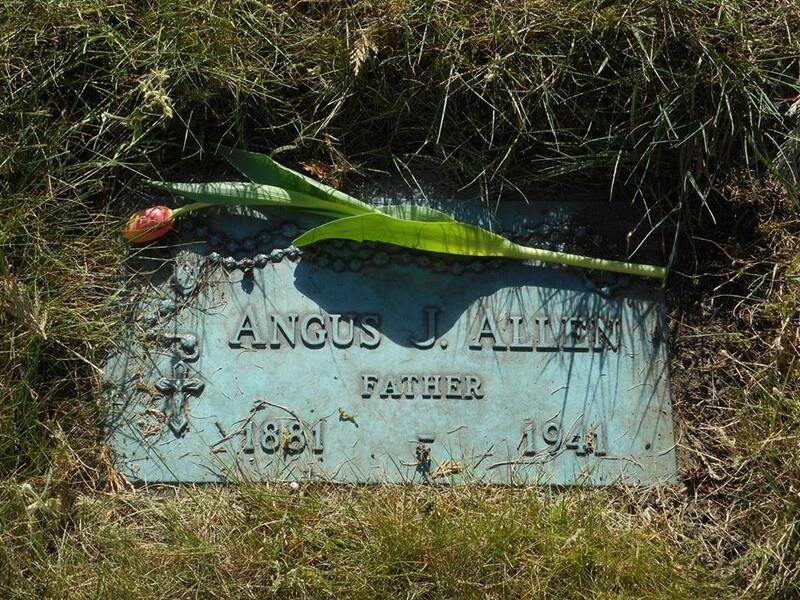 Angus Allen passed away in 1941 after a short illness and was buried at Ocean View Cemetery in Burnaby – his grave located underneath a large cedar tree. He was survived by his wife and five daughters. A quarter of a century later, ‘Bones’ was inducted into the Canadian Lacrosse Hall of Fame in 1966 in the field player category. Five years later he was inducted into the Cornwall Sports Hall of Fame in the lacrosse category. His wife Leslie Allen-Gordon passed away in 1983 and was interred next to Angus.